Discussion in 'Development Dispatches' started by moo1337, Dec 26, 2016. This development dispatch covers work completed since the Decred v0.6.0 release on November 09, 2016. Since then, developers have merged 187 pull requests into 10 repositories (see below for more detailed changes). This release contains bug fixes and improvements for dcrd, dcrwallet, and Paymetheus. 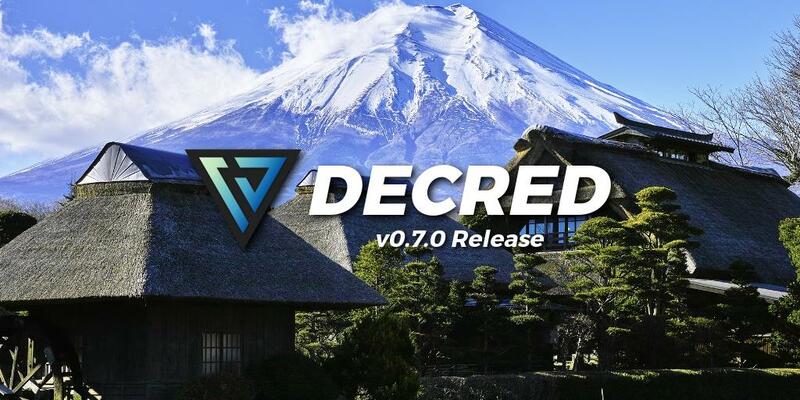 This includes the first release of decrediton, a new, cross-platform GUI for decred. This is not a feature complete version of decrediton. Simple operations (creating wallet, importing a seed, sending and receiving decred) are supported. This is primarily a demo of decrediton rather than a production ready tool. Please try it and report any issues or additional features you would like on the [github page](https://github.com/decred/decrediton/issues). Currently binaries are only provided for 64 bit Linux and OSX. Paymetheus has added seed restoration as well as the ability to show rescan progress. dcrd has various bugfixes and infrastructure improvements for voting in a future release. A new rpc command to resync has been added to dcrwallet. The functionality from dcrticketbuyer has been added to dcrwallet. See this commits for details on using the new functionality instead of the seperate dcrticketbuyer binary. gominer and copay are unchanged so there are no new binaries for them. You should use the previous release for either of them. chappjc, travanx, Reynold and 6 others like this. GUI wallets for Mac and Linux! It was mentioned on slack/IRC that this DD was technical and didn't make the release tangible for the layperson. Here's a breakdown of the most important parts of this release. Did all the PoW miners upgrade to the latest dcrd release? Did 75% or more of the stakeholders voting in the last stake version interval upgrade to the latest dcrwallet release? If these 2 conditions are satisfied, the stake version is incremented and the next voting period begins. There is a third condition, but it is more technical and messy to explain, so I'll gloss over it. The purpose of this soft fork is to act as a signaling mechanism that indicates the network is ready to upgrade consensus. Since this soft fork behavior is fundamental to how Decred hard fork voting will work, we have exhaustively tested the various scenarios that can occur at the ends of stake version intervals. This work was completed by @moo1337 and @davecgh. The code to activate the soft fork was roughly 1500 lines, but the test coverage was roughly 2500 lines. These tests simulate an entire blockchain and ensure that stake version changes behave properly under all conditions, including both positive and negative tests and behavior under reorganizations. We will strive to maintain this level of test coverage for any future consensus changes that occur as part of hard fork voting. If you're interested in checking out the code, have a look at dcrd pull requests 524 (soft fork) and 526 (test coverage). As part of our effort to get a GUI wallet that runs on all major platforms, we started work on decrediton, which uses Electron, React and Redux frameworks. In a single release, @ay-p has gotten most of the basics working for decrediton. Despite being in a very much "alpha" state, it can create simple transactions, generate a new seed, restore from seed, and receive payments. It does have a notable deficiency with the transaction history, but fixing that requires some more substantial work on the gRPC decrediton uses to interact with dcrwallet. By the next release, decrediton should allow users to do most things they can already do with the command line wallet, dcrwallet. In the meantime, do understand this is very much a work-in-progress and there will be something more "beta" available by early February. Some users may have noticed that dcrticketbuyer has been static for this release despite several open issues. This is because the code from dcrticketbuyer has been migrated to a separate package inside dcrwallet. This was done because in order to buy tickets, you need a wallet, so rather than require users to run 2 processes, a wallet for buying tickets and a ticket buyer, only 1 process is required. Another reason this was done is that automatic ticket purchasing in Paymetheus or decrediton creates a mess when using a standalone ticket buyer versus something integrated into wallet. The migration took @Javed Khan a while and it has now landed in dcrwallet. If you have any further questions about the release, feel free to ask. Reynold, N3wb1e, Emilio Mann and 3 others like this. Good work! Keep it up. I realize the intent was a high level overview, and I think the post did a good job of providing that, however I'd like to clarify that instead of all PoW miners, it is technically only 75% since what really happens is once 75% of pow miners upgrade, enforcement of the new stake version semantics defined for block version 3 starts. It is not until 95% when version 2 blocks will start to be rejected, so it is possible to reach an enforced voting period without all PoW miners upgraded. In practice, once the 75% threshold is received it shouldn't be long before the 95% threshold is reached and once that one is reached, it will necessarily go to 100% in short order due to rejection of old blocks at which point it will indeed become all PoW miners. Reynold and raedah like this. Overwrote binaries, running good so far. Great Job, we need the developer team never stop, always work for the future. This is an old wallet that I recently drained and moved my DCR to a new one. I ran the rescanwallet but still get the same results, I'm wondering what the 15.### DCR is and is it possible to get it back? Check the output of listaccounts. @Reynold i think its a unconfirmed revoke transaction. I have one in my wallet and despite doing everything devs told me it remains unconfirmed and funds locked. there's a guide to dcrticketbuyer settings or a discussion thread ? Otherwise slack or irc might be a good place to get some advice until those docs are improved. @sambiohazard we're you able to reseed and see if those ssrtx were still "stuck" ?